10/24 - The car is complete! Last year's car was the Black Widow, this year's car is the Fire Ant! 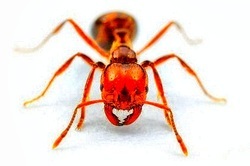 You may have to be a Texan to appreciate why fire ants are scarier than black widows (For one thing, they are aggressive - they will come after you! ), but the scout has hit the nail on the head with the naming. Keep reading or skip ahead to see pictures & video; more video will be posted here after the race. Let's recap the project: The scout is ten this year, so this is his last race. After last year's disappointing 4th place, he decided not to test fickle fate; rather than try for fastest again, this year we'd make the undisputed coolest car. So, we made the obvious decision. We built a fully-functioning Transformer-like object that in no way infringes on Hasbro's Trademark. Ours is cooler than a regular-old Transformer, anyway. Ours has fully-functioning headlights & an LED jetpack. Really, it was the only option we had. After all, we wanted to make the coolest car & what's cooler than a transforming pinewood derby car? Yep, nothing. If you haven't read the official log of the project, read it now. Go ahead, we'll wait for you. 10/25 - At long last, what you have been waiting for. This year there were 6 cars in the race; the Fire Ant was number 6. Our goal was to make the coolest car, but I must say - the competition was stiff! Each of the cars were amazing, each of them were cooler than the cars we made when I was a young scout. All of these videos are 1080p, view fullscreen to take advantage.